I would like to know if Jim Wilson has recieved the five e-mails I have sent in the past half hour. Each one has an image attachment and a caption. People have been begging for more photos. If Jim W. could reply on this board, or directly to hotbike@hotmail.com, it would be appreciated. No, I didn't get any of the five messages. I used the Resend feature on this computer. I hope the photos get thru. Unfortunately, The photos never made it to BR&K in time for the new issue. The new issue looks great, BTW. Some of the photos of Mellisa's Fiberglass Ladies Bicycle / Electric Moped appear on the mopedarmy dot com website. Take a look at OLDMANBIKE on EBAY. I like working on folding bikes. I have a few I need to sell. But I am always looking for old frames and bicycles. I just started work on a Raleigh Twenty. This is the ulitimate in vintage folding bicycles. This is a nice frame for all around use. the big modification was to cut the headtube down and thread the fork down so I can install a normal headset. The original headset was a plastic busing. I'd like to cut the headtube down. I'd save the cut-off piece for some other bike that needs to be built yet. Yours truly wrote articles for Human Power, the technical journal of the IHPVA, before there was web message boards. 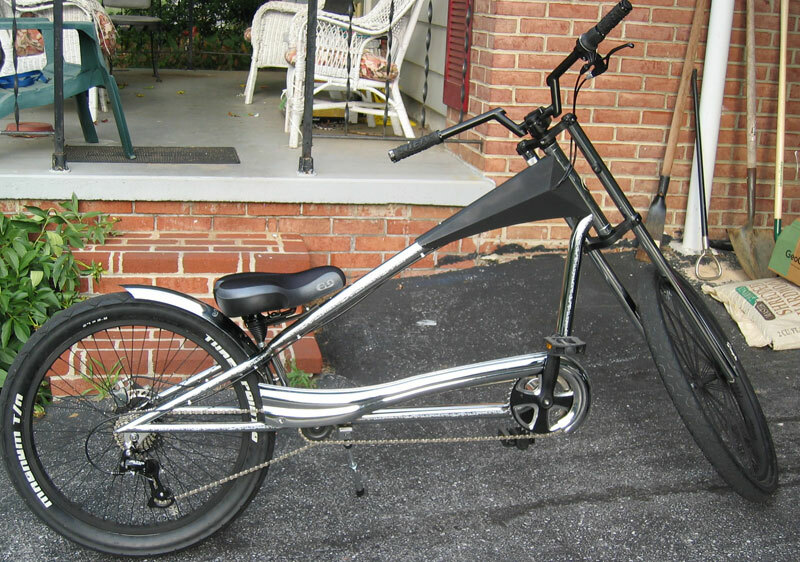 ok, I've got a 'generic 1960's stingray style' 20" bike and I'm trying to make it a wheelie bike but getting nowhere, I know they used to sell factory wheelie bar bikes in the 60's and after market wheelie bars, I've seen pictures of both and made a wheelie bar as close to both as I can but it seems IMPOSSIBLE to get it to work. the bike lifts up just fine and sits on the wheelie bar wheels but when trying to ride on the wheels it wants to just crash. everything is straight and all and this is my 6th attempt with the bike! I've tryed skate board trucks and now a single wheel and NOTHING works. did the factory wheelie bikes and after market wheelie bars ever actually work or where they just a 'looks' kinda thing? in full wheelie postion (sitting on the bar wheel) the front axle nuts mesure 20" to the ground. when the bike is parked the wheelie bar wheel (from the bottom of the wheel) is 5" above the ground and close to the back wheel. originally I had it further away from the back wheel but noticed from pictures the other bikes had them very close to the back wheel so I moved it closer to the back wheel but either way it still doesn't work. I just built a custom wheelie bar for my 20" bike. My bike is a newer bike, though. Mine works alright, but i think my im having the same problem as you it wants to wreck after you try to ride it. I think our problem is that we are now balacing enough to make it work right. Well that's all i know. the bike you describe is a custom lowrider. It has the builders initials, P/H, and is most likely one of a very small number of custom bicycles with those initials. How does it ride? The small sprocket is a clue that this is a rare bike , because no major bicycle producer would sell a bicycle with less than 42 teeth on the sprocket. If anyone else has more information about this bike or it's builder, P/H, please tell us more. now that ithink about it it probly is a coustom lowrider the paint looks coustom and it has some weird fabercation.It rids perity nice great for doing wheeles and turns head were ever it goes. a 50-year-old teacher and mother. be imposed for violating the law..."
I can not find out any info on my 1st bmx bike. My dad bought it for me 28 years ago by Mr. Stix, it's called the Wedge & it's retail price back then was $750.00. Does anyone know where I can get info on this bike? I happen to have a Mr. Stix wedge frame in my garage. As I recall Mr. Stix was Mr. Scruggs. and I remember his son racing who I believe is Billy Scruggs who raced at Flemington NJ in the early to mid 80's. There weren't many of these frames made. It's got great photos of the greatest kustom bikes from the past year or so, and it's been getting great reviews, even from people who don't have bikes in it. You did a great job compiling that issue. I have just had a second look at the bikes and some of the forks on those choppers are l-o-n-g-. Unfortunately, I am on a public library computer which shuts down in 4 minutes. The new issue's up. A software conflict developed before I could do the last few tweaks, and I couldn't get in to work on it; but the host's customer service techs are having some sort of holiday, so I decided to just put out the word anyway. Presumably, it'll be tweaked after the holidays. One needed tweak is removing the password block on the gallery page for Matt 7/32's "Deep Purple", first of the new batch of gallery pages. The password is "spokey". A couple of small gallery icon links aren't working, but you can get to both of them through gallery page 320, and hitting "next image'. I recently had a chance to take the dealer's Giant Stiletto for a test ride. The Stiletto handles better than any recumbent I've tried before. Put it this way, I tried a Rans Rocket and could not get the Rans moving. With the Stiletto, at least I'm sitting in a normal human posture. The seven speeds shift flawlessly. The big tires are easy to roll. The Stiletto stops traffic when you pull up to an intersection...It's like the front wheel is already visible to motorists before you are! I like the Giant Stiletto and I would consider one for my next bike motorization projects. I did not have any problem getting on the Stiletto or keeping it balanced. The closer bike builders follow Motorcycle design parameters, and avoid experimental recumbent designs, the better. I HAVE TO AGREE WITH YOU ,THE STILETTO IS AN AWESOME BIKE.I HAVE A CHROME ONE. I LOVE THE SMOOTH RIDE. I very much like my Stiletto as well with a couple of exceptions. The seat aggravates the he|| outta my lower back.. .and the pedals are a bit too close (yes, the seat is back as far as it will go). Other than that, it's a blast to ride for sure. The "Granny Gear" helps out considerably on the uphills and for the style of bike, it handles very well. He had four more inbound and they were all sold before he even received them! Alas... everything in my neighborhood is coated with either ice... or salt... hence, I don't take any of the customs out this time of year. i have recently purchesed a red stiletto i had some problems with the teriple trees and stem when i was puting it together but it is an awsome buy and a coooooooool ride!!!!! Please,let me know if you have been able to get a different saddle(more comfortable)for STILETTO. I"m putting about 100 miles a week on my stiletto. Until I have time to rebuild the seat, my solution for its lack of comfort as well as its being too close to the pedals is to not actually sit on it, but to slide the bottom of my backbone all the way up the back of the seat. This gives me room for proper leg extention as well as leverage for great downward pressure which is invaluable on inclines because you can't effectively stand on this bike. Neoprene wrap on the rear of the saddle is essential to cover the buttons and you might need a little neosporin on that part of your anatomy during the first week until it toughens up a bit. Has anyone found a replacement seat from a motorcycle that wraps over the rear wheel and allows for a passenger? Thats what I want. Also a simple 12 volt rechargeable battery kit to light it up. Hi, I put one of those Staton inc engines in my son's stiletto so now he rides it for miles. Because of the seat discomfort he was sitting right on the back edge of it and it broke the support. I've stuck a bit of wood under it and it seems to work ok but I'd sure like to find something more comfortable. I have attached a pic of my stiletto with a modified seat, this seat is quite comfortable. I installed a rear seat on the Electric Bicycle. The seat was the fiberglass seat salvaged from the attempt to build a 35 pound fiberglass ladies bicycle. The fiberglass ladies bicycle that I sold weighed 55 pounds. The attempt to lighten the vehicle by 20 pounds failed. Although the 40 pound bike has no problems. The seat is epoxy-fiberglass over foam board. It has a brown naugahyde (faux leather) cover over a cusion. The bottom of the seat has a longitudinal "rail" of 2"x6" dimension. I cut slots into the bottom of this spar to fit over the cross bars of the LaFree rack. It's only held down by a bungee cord. I haven't had any passengers on it yet, but I can ride the bike while sitting on it. In the parking lot of the RR Station it felt awesome, but I stareted thinking about ape-hangers.Again, coming down the hill on Duck Pond road, I sat on the rear seat. This time it was a great advantage as my wind-resistance decreased. I was leaning far forward to reach the 'bars, so my back was flat to the wind. I must've hit 40 mph. I also put a DOT legal orange triangle on the back. This way cars mistake me for one of the farm tractors and slow down.